If you’re trapped in $7,500 or more in debt, you may have already started researching debt relief options, like debt consolidation loans, debt settlement programs, and bankruptcy. By now, you may have even narrowed down your choice to debt settlement—especially if you can’t pay extra on a loan and you don’t want to put your assets at risk by choosing bankruptcy. Even if you’ve decided on debt settlement as your solution, you still have to find and compare debt settlement companies, and then choose the right one for you. Doing this on your own can be tough, especially if you don’t know where to start. Keep reading to learn how to find debt settlement companies, evaluate them, and choose the right one for you. Debt settlement is a debt relief option where either you or a company you hire negotiates with your creditors, getting them to accept less than you owe on your debt. Debt settlement goes by many names, including debt resolution, debt relief, or debt negotiation. The debt settlement company creates a debt relief plan based on your situation, which includes details on how much the program services cost and how long your program could last. Then, the debt settlement company sets you up with a bank account you control. You make monthly deposits into this account, according to your debt relief plan. While you build up funds, the company comes up with a negotiation strategy for your debt. Once enough money is in your account, they contact your creditors and negotiate to reduce what you owe. After your debt settlement company has reached a settlement agreement with your creditor, they contact you to approve the debt settlement. The debt settlement company uses the money in your account to resolve your debt with your creditor and collect their fee. This process repeats until all of your debts are completely resolved. Learn more about how debt settlement programs work here. Credit card, personal loan, and medical debt are all eligible for debt settlement programs. While this debt relief option could get you out of debt for significantly less than you owe, it carries problems and benefits—just like any other method of debt relief. Whether you are settling debt with help from a company or on your own, the goal of debt settlement is to get your creditors to negotiate with you. To do this, you need to prove to them that you are dealing with a financial hardship that makes it impossible to pay them back in full. Financial hardships can include divorce, job loss, medical expenses, or any other unexpected expense that makes it hard for you to pay back your debt. Debt collection calls: Your creditors or the debt collection agencies they send your debt to may contact you in an effort to collect on your debt. Possible legal actions: If you don’t pay your debt, your creditor has a legal right to take you to court. Credit score impact: Not paying back your creditor according to your original agreement may negatively impact your credit score. It’s true that debt settlement may have some potential problems, but to the hundreds of thousands of Americans who have chosen this solution, the benefits of debt settlement are worth the risks. If you’re dealing with massive debt and don’t know how you’ll ever pay it off, a debt settlement program could be right for you. Here’s why so many people enroll in debt settlement like Freedom Debt Relief instead of taking out a consolidation loan or applying for bankruptcy each year. Affordability: Most debt settlement programs only require you to pay one monthly program payment that could be even less than your current monthly minimum payments. At Freedom Debt Relief, we work with you to make sure that your monthly payment fits your budget. Speed: Depending on the company you work with and how much debt you have, a debt settlement program could help you clear away your debt much faster than making minimum payments. Freedom Debt Relief could help clients be debt-free in as little as 24-48 months. Savings: Since debt settlement companies work with creditors to settle your debt for less, they could help you save hundreds or even thousands on your debt. While no debt settlement company can guarantee it will save you a specific amount, Freedom Debt Relief has a track record of helping thousands of clients significantly reduce what they owe. Relief: When you work with the right debt settlement company, you’ll have experts on your side advocating for you and helping you get out of debt. In their client testimonials and reviews, many Freedom Debt Relief clients talk about how enrolling in our debt settlement program took the burden of debt off their shoulders. Now that you know about the benefits and risks of debt settlement, it should be easier for you to decide if this is the right solution for you. The next step is to research your options so you can make an informed choice on which debt settlement company to work with. Deciding that you want to explore professional debt settlement is one thing. Finding the right company to work with is quite another. Some companies find you – by advertising on radio, online, or on television to let you know they’re ready to help. But it’s never a bad idea to put in a little extra effort to seek out and talk to multiple debt settlement companies so you can make sure you’re making as educated a decision as possible. Do a quick internet search: Simply searching the term “debt settlement company” online could get you in touch with multiple companies that could help. Check out their websites to determine if they are legitimate. If the website looks outdated or doesn’t provide you with the information you’re looking for, avoid working with the company. Check out third party review websites: Websites like Trustpilot and Best Company have reviews from clients who have already worked with companies you might be considering. By reading these reviews, you can understand how the company works and whether or not it’s the right choice for you before you sign up. If you’re thinking about enrolling in a debt settlement program but can’t find reviews for it online, chances are that company could be a scam. Ask people you trust: If you’re struggling with debt, you’re not alone. In fact, someone you know may have also been in the same situation. Ask around to see if someone you trust has dealt with a debt settlement company before. If they had a positive experience, chances are you will, too. Taking a few hours to research debt settlement companies could help you narrow down your options and come up with questions for the company before you call them or fill out one of their online forms. Watch out for debt relief scams! Learn how to identify a debt relief scam here. Once you have your list of 2-3 debt settlement companies that you are considering, the next step is to get on the phone with one of their representatives so you can get the answers you need to make your final choice. Make sure you are talking to an IAPDA-Certified Debt Consultant, not a salesperson. When someone has earned IAPDA Certification, that means they have been trained in various debt solutions and have met strict qualifications requirements. Basically, they’re debt experts. Talking to someone with this level of expertise is extremely valuable, which is why every single debt evaluation Freedom Debt Relief provides is with an IAPDA-Certified Debt Consultant. Their job is to listen to your situation, answer all your questions, and help you determine if our program could be right for you. When it comes to deciding which company is best for you, there is simply no substitute for a phone conversation. Not only will you be able to ask the exact questions you want, you’ll be able to get a strong sense of how trustworthy and transparent the company is. Be wary if the person on the phone makes specific promises about how much money they could save you or how quickly they could help you get out of debt before they’ve even really reviewed your situation. And if they pressure you to sign up immediately or send money, hang up! Remember that this is a two-way conversation. While you may need some guidance about your debt, this is your opportunity to learn important things about how the company operates, and what their mission is. Here are 4 key questions to ask every debt settlement company you talk you. Write down their answers and compare what each company told you. That ought to help make it a lot easier to determine the right partner for you. Many companies may focus on talking about how low the monthly cost will be, and neglect to explain that the monthly cost is directly related to the length of the program. The less you pay each month, the longer it will take for your debt to be resolved. Make sure you understand the relationship between the two, so that you are focusing on the goal you want. If you want your debt behind you as quickly as possible, you’ll need to pay more into the program each month. On the other hand, if you want to pay as little as possible into the program each month, it will take longer for your debt to be resolved. Look for a company that does what Freedom Debt Relief does: provide an itemized estimate for you to review at your own pace. It should include an estimate of the dollar amount you’ll need to deposit into your account each month, an estimate of the fee and how it’s calculated, and an estimate on how many months your program will take. Note that all the costs will be estimates until you go through the formal enrollment process and all the numbers are finalized. Asking this question will reveal how transparent the company is about how much the program costs and how those costs are calculated. If they are vague or won’t put anything in writing, beware. Every reputable debt settlement company will charge a fee for its services, but per a 2010 Federal Trade Commission ruling, they are only allowed to charge that fee once they have actually settled one of your debts. So if a company makes a big deal about how they charge no upfront fees, it’s no great achievement. They are simply obeying the law. Therefore, if any debt settlement company you talk to insists that you pay fees up front, you shouldn’t work with that company. One thing to note, however, is that in the early part of your debt settlement program, when your account is being set up, the bank that manages the account may charge a small account management fee. This a perfectly normal, as it’s a fee associated with bank servicing, not with the debt settlement company. The fee amount is a percentage of the total amount of debt you enroll at the start of your program and should not change through the life of your program. So if a debt settlement company talks about fees going up or going down over the course of your program, that’s a red flag. Some states put a limit on how much a debt settlement company can charge to its residents, so depending on where you live, a debt settlement company may or may not have flexibility on how much they charge in fees. For example, they may charge a lower percentage fee on a greater amount of debt or a higher percentage on a lower amount of debt. Most debt settlement company fees range from as low as 15% to 25%. Anything higher would be unusual. Newer, less experienced debt settlement companies may avoid sharing how many creditors they work with, because it could reveal that they don’t have a long, proven track record. Watch for vague answers like “we’re adding new creditors every day.” What if one of those “new” creditors is your creditor? Would you want to rely on an inexperienced negotiator to get you a great settlement? It’s important to note that not all creditors work with all debt settlement companies. So ask each Certified Debt Consultant you talk to if their debt settlement company negotiates with your specific creditors. Don’t be surprised if some debt settlement companies do, and others do not. Negotiating with creditors is an area where Freedom Debt Relief, being the largest debt settlement company in America, excels. Because we’ve resolved over $10 billion in debt since 2002 (much longer than our competitors), we have long, established relationships with hundreds of creditors. And, more importantly, we have massive amounts of exclusive data and insight that helps us predict creditor behavior and create the best negotiation outcomes for our clients. Some companies may refer you to review websites that look official, but are really just advertisements. If you see phrases on the website like “sponsored listing” or “advertiser disclosures”, that is a sign that the debt settlement company paid to be on the website. That’s not necessarily a bad thing, but you should see the website as an advertisement, not a consumer advocacy website that exists to help educate you about your options. Another clue that a website only features debt settlement companies that paid to be featured is if you don’t see anything about Freedom Debt Relief. As the largest debt settlement company in America, we should be included in any consumer advocacy website that claims to offer objective reviews of debt settlement companies. 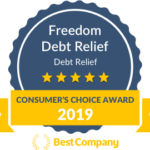 Freedom Debt Relief is proud of the reviews clients take the time to share on consumer advocacy websites like Trustpilot, Consumer Affairs, and Best Company. And of course we share client reviews and client interviews on our website, but we encourage you to visit any review website you already trust to see what our current and former clients have to say. If a debt settlement company you’re considering can’t answer the questions above, this could be a red flag that you shouldn’t work with them. At Freedom Debt Relief, we take pride in answering all of your questions directly, from your very first call to the end of your debt settlement program. So let’s talk! If you think debt settlement could be your way out of debt, take the first step today by calling Freedom Debt Relief. Our caring Certified Debt Consultants are standing by, ready to answer all your questions. When you call us, we’ll discuss all of your debt relief options—not just our program. And if it turns out that our debt settlement program isn’t the best solution for your debt, we’ll help you find one that is. Call us now at 800-910-0065 or fill out our simple online form to request your free debt consultation and find out if we could help you get out of debt faster and for significantly less than you owe. How does debt relief work? Debt Relief: what are you options?